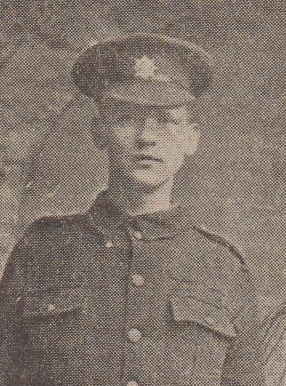 We have also received information of the death of Private John James Holden of Rising Bridge. who was killed in action at Ginchy on September 15th. He was 26 years of age, and was in the Coldstream Guards. He was an esteemed member of St. John's Church, Stonefold, and was secretary of the Church Institute. Another brother, Private T.E. Holden, was wounded in the last attempt to relieve Kut. We regret that owing to the photo of Private Holden arriving too late for reproduction in the present issue, we are compelled to hold it over until next week. At St. John's Church, Stonefold, on Sunday evening, a memorial service was held to the late Pte. John James Holden of Brunswick Terrace, Rising Bridge,who while serving with the Coldstream Guards was killed in action at Ginchy, on September 15th. The Vicar, Rev. B.S. Ainley took as his text, "Now no chastening for the present seemeth to be joyous, but grievous; nevertheless, afterward it yieldeth the peaceable fruit of righteousness unto them which are exercised thereby." Hebrews, 12th chapter, 11th verse. He referred to the deceased as a keen zealous man in God's service in the parish, and though he (the Vicar) only knew him by name, yet from many who had spoken about him he found they had lost from their midst one who was deeply respected. Whether as a choir boy or a choirman, in the Sunday School or in the church, or as secretary of the Church Institute, he was always ready to do his part. God had called him out of the noise of battle to heaven's perfect peace and though they mourned for him they mourned and sorrowed not as if they had no hope. They knew that having been faithful and endured to the end, there was laid up for him a crown of immortality. He had given his life fighting for the greatest cause for which the arm of man had ever fought, for justice and right and the defence of the weak. The organist, Mr. Fred Tattersall, A.R.C.O., played "O rest in the Lord", at the beginning of the service and the "Dead March" at the end of the service. There was a large congregation, and an offertory was taken on behalf of the fund for providing Christmas parcels for soldiers of the parish.